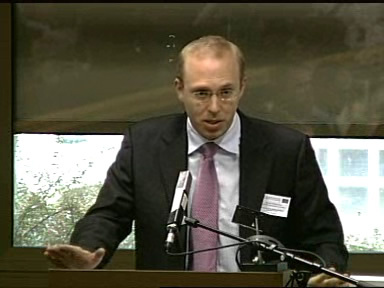 Last week, Decision Science News spoke at a European Commission conference on “How Can Behavioural Economics Improve Policies Affecting Consumers?“, which was terrifying, as it meant addressing a large room of people with name cards and microphones and simultaneous translators behind glass walls. The DSN editor tried to emphasize how one must consider the cause of default effects when setting policies that govern which defaults should be prohibited, as discussed in a recent HBR article (Goldstein, Daniel G., Eric J. Johnson, Andreas Herrmann, and Mark Heitmann (2008). Nudge Your Customers Toward Better Choices. Harvard Business Review, 86(12), 99-105.). 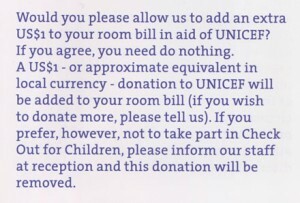 As he was checking into the Sheraton Brussels Airport Hotel, he received a brochure with his key card, stating that unless one opted out, a donation to UNICEF would be added to the hotel bill. Fascinating, I wonder if the default choice once well known will lose its effectiveness. On a side note I recently ran into someone who worked with UNICEF in Africa (Liberia) for several years, he said not to support them; caught me by surprise. He considered them an irredeemably corrupt organization. 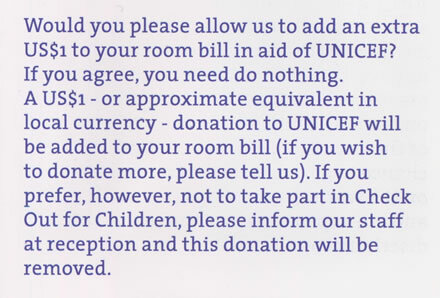 Opt-out for charity? was written on December 5, 2008 and filed in Conferences,Encyclopedia,Profiles,Research News,SJDM-Conferences.